(photo Mark Luinenburg) Growing up in New York in the 1960s and 70s, there were two options when you walked into a pizza place: “regular” (thin-crust) baked right on the hearth, or “Sicilian” (thick-crusted), baked in a pan. I’m fairly certain I didn’t know where Sicily actually was, and my parents were partial to “regular,” so that’s what we got. Eventually I started going by myself and tried the chewier, thicker stuff. 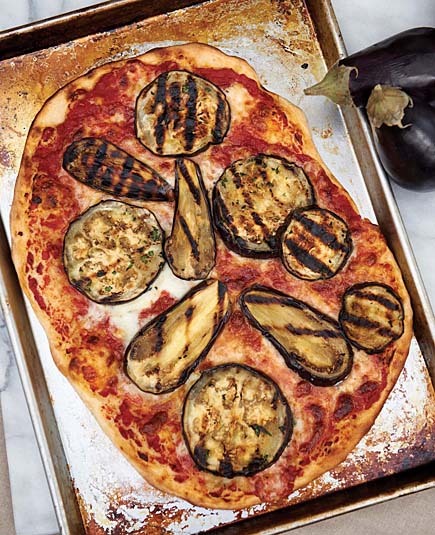 It’s a hit with kids, and for many of our readers, a pan-built pizza is an easier trick than the traditional free-form pizza slid off a peel (see Zoe’s post on that). OK, here’s how to make the perfect Sicilian crust. Preheat your oven to 500 degrees F (250 degrees C), about 30 minutes before you’re ready to bake— this assumes you leave a baking stone in your oven as I do (they take a long time to heat up). But the pan we’re going to use makes the stone optional– you don’t absolutely need it with pan-pizza. If you don’t use it, a shorter pre-heat is fine. If you do use it, drop the pan right onto the hot stone. Weigh two pounds (910 grams) of dough, or estimate (a small cantaloupe or a very large grapefruit). Digital scales are very nice for the task. Start the stretching process by dimpling with your fingers and spreading the dough out, being mindful of the need to eventually create a rectangle, not a circle. It’s OK to use a rolling pin (I love the no-handle French milled style). We joke in the book that it’s against the law in Italy to use a rolling pin… at least for Pizza Napoletana (Neapolitan-style thin-crust). But maybe we’d be OK here since this ISN’T Neapolitan thin-crust? Generously grease an 13 by 18-inch heavy gauge rimmed baking sheet with olive oil (the Chicago-metallic plain un-coated aluminum is my favorite). Thinner pans burn the bottom crust, and non-rimmed pans will leave you with an oily mess in your oven. Drop the rectangle into the pan and take a little time to press it all the way to the edges and to the corners. It’ll tend to spring back on the oiled surface but just be patient, walk away for 5 minutes and it’ll relax. Sauce it up– it’s a big pizza, so we call for 3/4 cup of the tomato topping of your choice (see the book for options). Ready for the cheese and toppings– in the book, we built a traditional Sicilian Sfinciuni onion pizza like in the picture at the top of this web post, with 6 ounces of mozzarella, 3 ounces of grated pecorino Romano cheese, 2 large sweet onions thinly sliced (you can decrease to taste), and a couple of tablespoons more of olive oil for drizzling. It bakes up in about 20 to 25 minutes. You may need to turn the pan around while it’s baking. When the crust and the cheese are browned, cool slightly, cut into squares and serve. Never mind the Sicilian, how do I make the regular crust? I grew up in NYC at the same time, have lived in Northern VA for years and want to replicate NY pizza joint crust.Yet to achieve the right crust texture! Nope, Jeff, that’s the sort of pizza you get at the fancy-schmancy places with the thin crispy crust. I am talking about the sort of pizza you buy from the place on the corner with a window on the street where they used to hand you a slice (and all you asked for was a “slice”)wrapped into a sheet of wax paper. Crust is thick enough to be chewy, but flexible enough to fold. End has a crisp crust with hollows in it, from air bubbles. Have been attempting to make pizza like this for most of the 23 years I’ve been in exile from home. Will try the Sicilian, but it’s what would probably be termed “Neapolitan” that I yearn for. 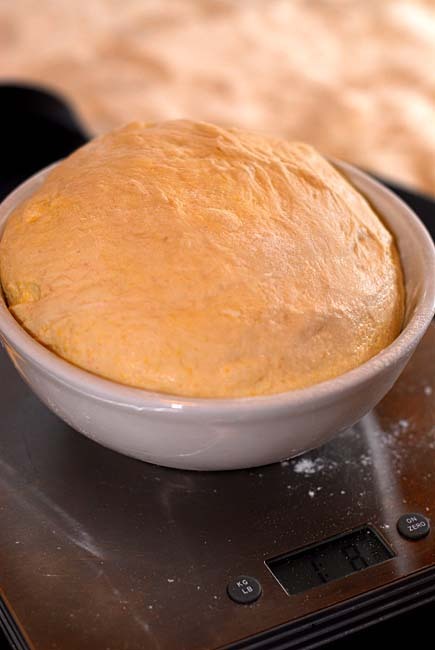 Elizabeth: Try the one in the new book (http://ow.ly/7nmI8 on Amazon)– the Stronger Dough… for Throwing. And don’t make it quite so thin. It’s designed for a tenderer result. I have all three books and I regularly “stock” the master recipe from the first book. Is there much difference in results between using the master recipe from the flatbread book and the master recipe from the first book? If there is enough of a difference, I will keep both on hand but if the difference is barely discernible then I can skip keeping two kinds on hand. And like so many other posters, I have been a bread evangelist at work and have several of my co-workers baking from your books. The ratio of the dough from the pizza book is slightly different, but the master recipes are pretty similar and you can probably get away with just having the one on hand. You should really try some of the other recipes in our new book and find your favorite new crust, just for fun. Use all the tips and techniques to create a great crust, no matter which dough you choose. Your comment about being a bread evangelist at work really made me laugh because that’s all I’ve been doing since I started making this bread about a month ago. I was even asked to bring bread in, so I baked a loaf one morning and brought it in with butter, olive oil to dip in, a chunk of good cheese. My co-workers love it! Just made dough tonight & am looking forward to making crackers tomorrow and pizza on Friday. If I have 2 stones, can I cook two pizzas at once or do you recommend only one at a time? I do two at once and am quite happy with the result. It is a good idea to keep an eye on them and make sure the top one isn’t burning the cheese too soon. Once you get the timing down it is a great way to bake many more pizzas, quickly. 1. 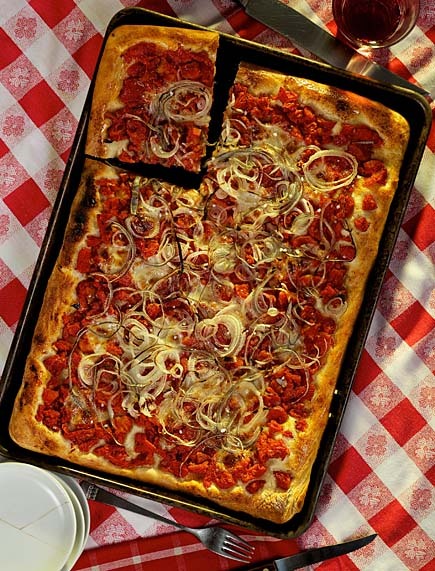 Can the sicilian pizza be baked directly on the baking stone? And 2. maybe do you have recommendations for why they burned? Too little oil? Too thin crust? First thing I’d wonder is whether your oven temp was off (check with something like http://ow.ly/8CVPU), whether you were baking too close to the floor of your oven (overdoes the bottom-crust), or whether you’re using a thin, poorly conductive pan for your Sicilian. We prefer the really thick ones like http://www.amazon.com/Chicago-Metallic-Commercial-Traditional-Jelly-Roll/dp/B003YKGRPK/ref=as_li_wdgt_ex?&linkCode=wey&tag=arbrinfimiada-20. Using this one…ok or should I replace? Does the olive oil dough work well for this thick crust pizza? I love it when I make the thin crust pizza. Also, can you parbake the thick crust pizza and then say put sauce and topping on the next day and finish baking? Or would you parbake the whole thing? How long would you parbake? Thanks for your help. Barbara: Which olive oil dough do you mean (which book, recipe, page number)? Does the olive oil dough work well for this thick crust pizza? I love it when I make the thin crust pizza. Also, can you parbake the thick crust pizza and then say put sauce and toppings on the next day and finish baking? I want to bring a pizza to a friend’s house after work, but don’t have time to do the shaping and I thought maybe we could finish baking at her house. Thanks for your help. Would it work to freeze already shaped pizza dough? I’d like to make individual pizza crusts and freeze them, to top and use later. Is this possible? We talk about this at length in the new book, it works really well! Check on page 51 of the pizza book for more freezing tips! I own ABin5 and HBin5–I guess I’ll be adding the new book to my Christmas list. 🙂 Thanks! sorry Georgio, can’t include links we’re not specifically familiar with, but thanks so much for your comments and dough formula. The olive oil dough in the first book on page 134. How do I keep the dough from bouncing back? I have a bucket of 100% whole wheat dough from AP&Fin5 in the fridge. I have looked through the book several times, and I can’t find a baking time or temperature for the pizza. Do you just leave it in for 10 minutes at the 550 preheat temperature? Alot of people wanna make good hearty pizza just like when we were growin up . Iam posting a recipe that i have had since my grandfather Vincenzo used in our pizzeria back in brooklyn in the 70’s & 80’s .Who ever uses this recipe will have to break it down mathematically to get the right amount of pizzas for their liking , i only deal in big quantities so here we go ..
16kg high gluten flour or caputo if u can get it . 270g salt, 60g instant dry yeast, 240g oil, 9 litres of cold water .. I have made this pizza many times! It always comes out great. My husband is from NYC and misses the thick crust pizza. I have both bread books and really enjoy your recipes! I am originally from Germany and your bread makes me happy every day! I haven’t bought any bread in a store for months now. Many friends and coworkers got hooked as well after I told them about your books. Please keep on writing and coming up with new recipes! With guests arriving shortly following the time we would be arriving home from an event, we prepped the dough in the cookie sheet the night before, and covered it tightly with plastic wrap (but not touching the dough). The next afternoon, upon arriving home, we brought it too room temp, topped, and baked. This worked out excellently. 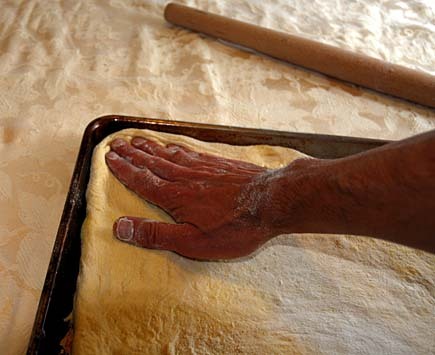 And it saved us from having to work on rolling the dough and getting a bit messy while the guests waited. This delay-of-game (an alternate version of the overnight-rise-trick, really) worked out excellently. Made one with the olive oil dough and one with the peasant dough. Both were great, and subtly different in texture and baking time. Used the old “check the bottom of the crust” method I’ve seen in all the NYC pizza shops. A small spatula was useful to get into the tray. Also made one topped with only (in this order bottom to top) arugula, sliced tomatoes, and thinly sliced onions, and drizzled with olive oil. The wife loved it. Thanks for your tips, Eitan! For Sicilian pizza, the mozzarella goes on the dough. Then the toppings. This prevents the dough from sogginess from the liquids. Also oil both sides, for the same reason.